Exciting New Offer – Canvas Groupings! You spend hours obsessing over what to wear before our session, maybe hours getting ready the day of your session and then of course the time at our session. You spend so much time wanting to make it perfect and ensure you look your best in your images. However, once you have your digital files in hand, they never actually ever make it off that USB drive. Cue sad face. I get that everyone wants to have the digital files so that they have the freedom to print whenever and wherever they want. However, I find that many times (most times) it never happens. I’m even guilty of this – until now! While I still offer digital files, they are paired with printed products so that you can enjoy your images in your home – not just on a USB drive. Listen, I was even guilty of not printing my images. Aside from our family year book and a few photos printed small around our house, our family photos were largely left to rot on a hard drive. Until now – the middle of last year I found a canvas printing company that I loved and ended up ordering a number of groupings for my walls and my mom’s walls! To say they are beautiful is an understatement – I’m in love! I love walking by it every day and seeing my children smiling back at me. 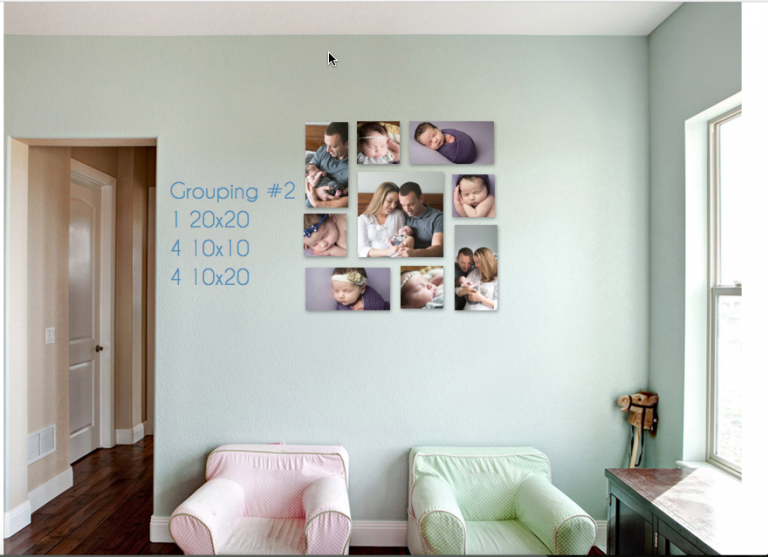 So, to this end, one of the specialized products I’m offering now are canvas groupings (the exact groupings that I have purchased and displayed in my home). 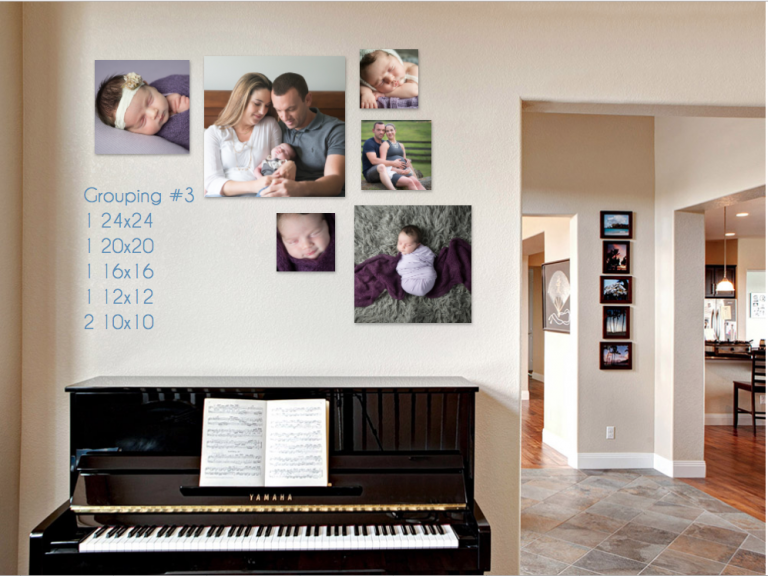 You can certainly purchase the canvases individually (and I can help you decide what size is the best size to have on the wall you’re looking to decorate), but these are designed to make your lives easier as they are a set collection of the most popular sizes arranged to fit any size wall. All you have to do is pick the configuration, pick the images and I’ll assemble a mock up like the ones you see here so that you can see how it looks on your wall! You can even send me a picture (or I can take one while I’m at your home) so that we can show how it looks in the exact room! So, if you’re interested in any of these canvas groups and haven’t yet booked a session, click here to get in touch so we can get a session set up. Past clients who already have their galleries with me, I’m more than happy to go back through and help you assemble a beautiful collection that will fit any wall in your home.